Resol® Technology is the patented method developed by Repolar to extract and prepare stable aqueous solutions with active ingredients from natural Norway spruce (Picea abies) resin. Spruce resin is a mixture of hundreds of compounds produced by a coniferous tree. 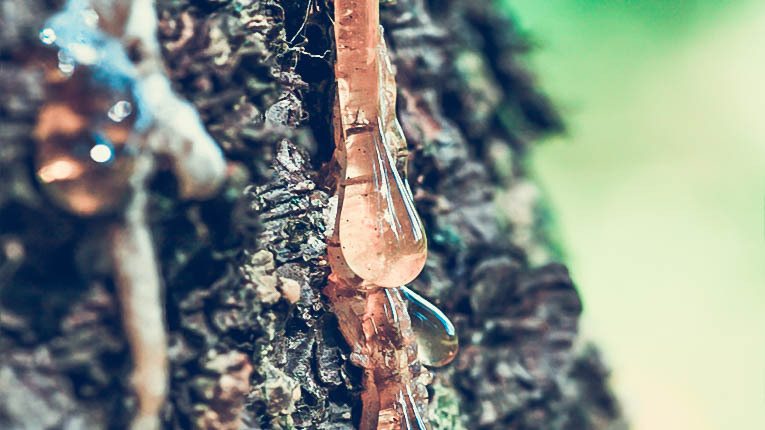 The purpose of the resin is to protect the tree from external influences including different microbes (bacteria, fungi, yeast, mold) and insects, as well as dehydration and other physical stress. The tree produces at first so called physiological resin providing physical barrier and later other components that are highly critical for the long term protection and healing of the defect. The resin composition is based on a natural evolution throughout millions of years enabling the trees to live in a hostile environment. To capture this nature’s unique defence mechanism into use as medical devices in the modern medicine requires evidence on safety, efficacy and product functionality according to ISO 13485 requirements. Repolar uses unique and patented processes in manufacturing of solutions including the active components of the natural Spruce resin. The processes are designed to provide stable and safe solutions maintaining the broad natural effectiveness of the resin that protects and heals the coniferous trees. With extensive studies the resin based products produced by Repolar Pharmaceuticals have shown to be safe. Only known contraindication is resin allergy caused by components that are known to cause allergic reactions in people who are sensitive to natural resin. Repolar Pharmaceuticals Oy has made extensive research on the resin compounds and their efficacy, functionality and safety. The Doctoral Thesis of Arno Sipponen (2013) provides comprehensive overview of the results. Resin is strongly broad-spectrum antimicrobial against common bacteria, fungi and yeasts, including typical resistant bacterial strains like MRSA and VRE. It is especially effective against gram+ bacteria, it also does work on certain gram- bacteria, like E. coli. Wound infections are often caused by Staphylococcus aureus or its resistant version MRSA, which are covered in the antibacterial efficacy of the resin. Resins antifungal efficacy covers dermatophytes of the Trichophyton, Microsporum and Epidermophyton-geni. Tricophyton fungi is typically responsible for the fungal nail infection and Athlete’s foot. Resin has been shown to be strongly microbicidal also against common yeasts causing infections in human and animals, like Malasezzia and Candida albicans. Research & Development and strong focus on scientific and clinical evidence has been a cornerstone for operation of Repolar Pharmaceuticals Oy since 2000, even before the foundation of the company. The scientific base for all products lies in the foundational research conducted on Norway Spruce resin and its efficacy on treatment of humans and animals. The research team consisting of multi-disciplinary experts from fields of medicine, microbiology, mycology, chemistry, forestry and technology has been able to prove scientifically the safety and efficacy of resin and its resin products. Repolar has conducted several clinical trials on multiple products and indications in association with experts in their field. We are actively working in strengthening our clinical trial base also in the future with new studies. We work actively with our partners in developing new products and the technology to use resin components in new applications and new indications.